I am not sure of the origin of this apple, other PF varieties originated in the Morden Research station in Manitoba, so this may have too. If anyone knows please advise. This is the largest apple that grows in Fairbanks. Our apples were all 3-4" in diameter, and I have heard of them getting up to 5" in diameter. 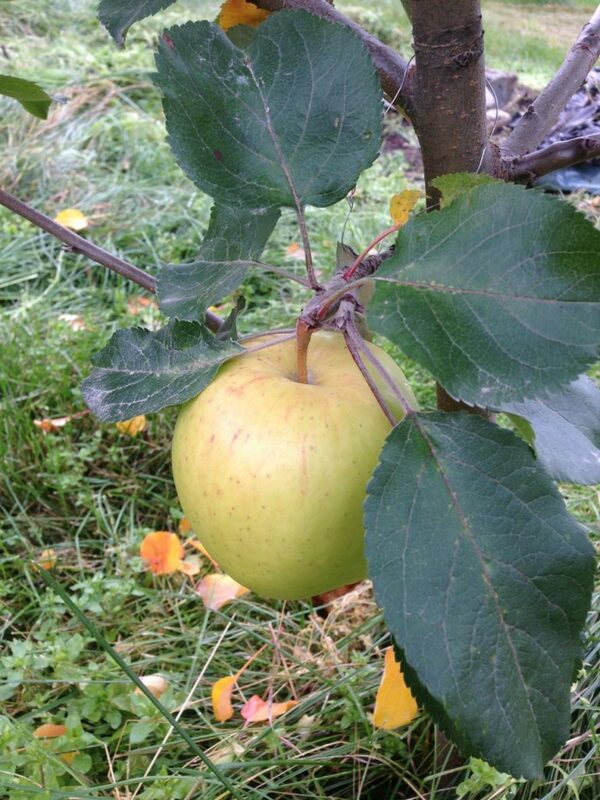 It is a soft apple, ripening early to mid Sept in our orchard, with a very slight blush from merging red speckles. It is not especially good eaten fresh, but tasted incredibly good when dried, and I think will make a good sauce apple as well, and possibly a cider option. Being so big makes them easy to deal with, and who can complain about 3-5" apples even if they're not especially good? The tree flowered at 2 and fruited at 3 years, it shows average vigor on Ranetka, and has reasonably good crotch angles with somewhat upright growing branches, needing training. So far it has been immune to the winters and has had no dieback over the past 5 winters. I will be planting more of these. Set its first crop of fruit at 5 years of age.